Clinically proven relief for sensitive teeth. Extra protection for sensitive teeth. Whitens teeth. Same technology dentists use. Long lasting relief from first use. Smile twice as wide with extra strength protection against sensitivity and whiter teeth from Colgate Sensitive Pro-Relief Smart White Toothpaste. The unique, safe whitening formula with Pro-Argin® and CalSeal? Technology fortifies and seals channels to sensitive nerves, while whitening enamel. Brush regularly for lasting relief and a brilliant white smile. 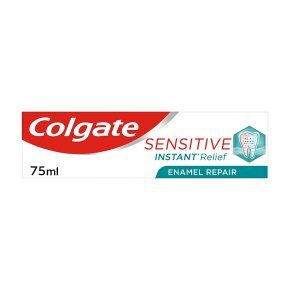 Directions: For instant relief, apply directly to the sensitive tooth with your finger tip, and massage gently for 1 minute, up to twice a day. For children 6-12 years old, use only once a week or less frequently. For lasting relief, apply to a gentle toothbrush making sure to brush all the sensitive areas of your teeth. Brush thoroughly for 2 minutes, twice a day. Children 6 years and younger: Use a pea-sized amount for supervised brushing.